I have recently watched the exciting Classic Doctor Who episode Robots of Death, in which The Doctor (Tom Baker) and Leela (Louise Jameson) arrive on an inhospitable and Barren planet where, a huge sandminer vehicle, Storm Mine 4, is slowly scraping the surface in search of precious minerals. The sandminer is manned by a crew of nine humans led by Commander Uvanov, Dask and Poul who work alongside numerous robots – black ‘Dums’ that cannot speak, pale green ‘Vocs’, and a silver ‘Super Voc’ which controls all the ‘Dums’ and ‘Vocs’ who perform all the hazardous tasks. Meanwhile the Doctor eventually convinces The crew that he is not responsible for the murders, and they ask Him for help, so he suggests somebody may be reprogramming the Robots to clobber people. However they reject the idea citing Asimov’s first Law of Robotics – No robot shall kill a human being. So he suggests they may be malfunctioning and agrees to help before more rogue robots start running amok and clobbering people. He then discovers that One of the robots, D84. and Poul are in fact undercover agents for the mining company, who were placed on board the miner as a precaution to threats of a robot revolution by a Mad scientist called Taren Capel, who was raised by robots and aims to end Robot servitude and maltreatment at the hands of human beings and free them, so they can rule the world. The Doctor then faces a race against time to reveal who Taren Capel is before more people die. Today is the Anniversary of The Normandy Landings which took place on June 6th 1944. Codenamed Operation Neptune, they were the landing operations of the Allied invasion of Normandy, in Operation Overlord, during World War II. 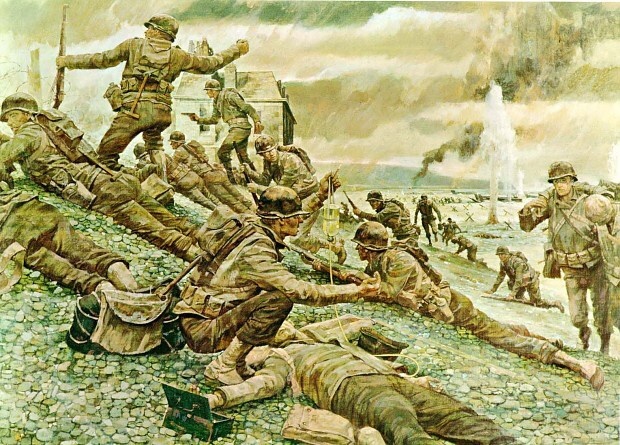 The landings were conducted in two phases: an airborne assault landing of 24,000 British, American, Canadian and Free French airborne troops shortly after midnight, and an amphibious landing of Allied infantry and armoured divisions on the coast of France. There were also decoy operations under the codenames Operation Glimmer and Operation Taxable to distract the German forces from the real landing areas. Supreme Commander of the Allied Expeditionary Forces was General Dwight Eisenhower while overall command of ground forces (21st Army Group) was given to General Bernard Montgomery.